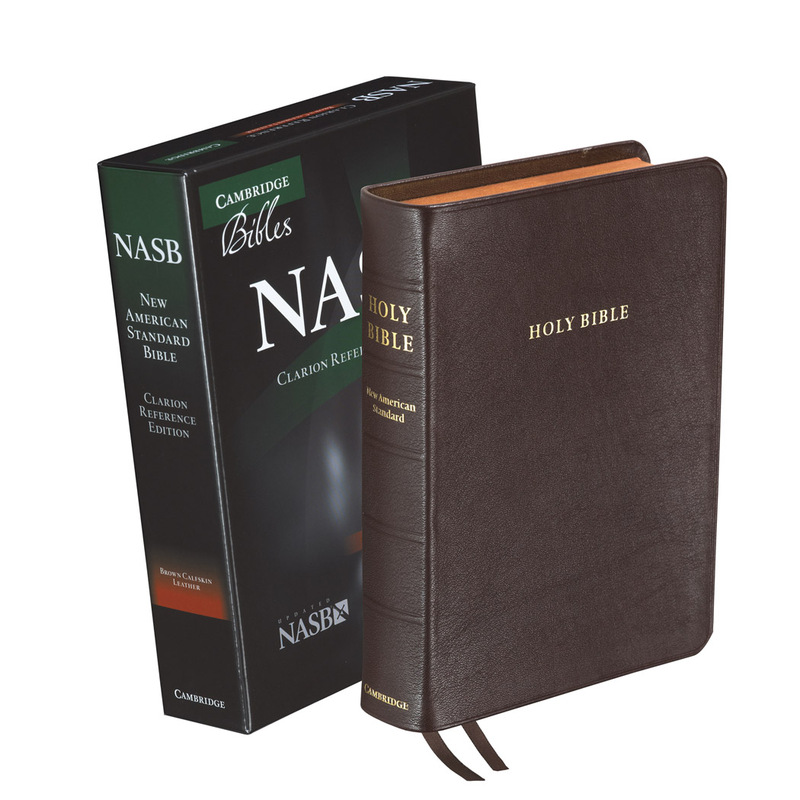 Cambridge Clarion Bibles bring together several attractive design features-readable print, single-column layout, and paragraph format-in a personal size Bible. The text runs right across the page, with the cross-references moved to the outer margin, to give the page a very well-laid-out appearance. The type size is just under 9 point with generous line spacing, making the Bible text extremely clear and readable. The Bible has 15 new color maps and a concordance. There are two ribbons to keep the place in different parts of the Bible. These Bibles are of the highest quality, printed on India paper, with black letter text, and Smyth-sewn for flexibility and endurance. There is a range of superior binding styles: calf split leather, top-grain calfskin, and edge-lined goatskin. click here for photos of this Bible series. Just received my NKJV in the mail. Absolutely fantastic. The binding is like “butter.” I have 5 Cambridge Bibles, 7 including my New Testament – Psalms. Cambridge never disappoints. Quality is consistent all across the years. Evangelical Bible packaged the Bible perfectly and it arrived exactly on time. I have been a Cambridge fan for a long time. 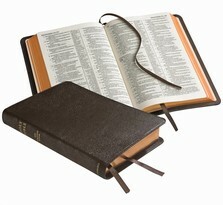 Their Bibles are among the best quality Bibles on the market. The Clarion is no exception; to the contrary, it’s a step up from their previous productions, in my opinion. And that is really saying something. 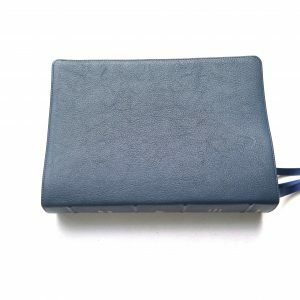 The black goatskin cover is pure luxury! It is so soft and supple, the Bible literally “drapes” over your hand. The superb binding allows it to lay open from Genesis 1 to Revelation 22. The Indian paper is quite thin but with the “creamy” opaqueness and line matching, there are no “shadowing” issues hindering the reading experience. It is a real luxury to hold and read from this Bible! This is my first experience with a “Reader’s Bible.” The text is formatted in a single column with the references in the outside margin. 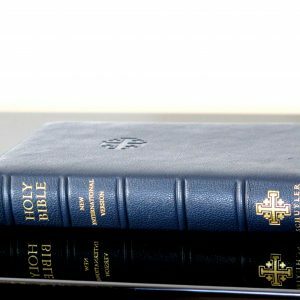 The chapters, verse numbers, headings, and references are greatly deemphasized. The single column format seemed a little odd at first because I had never read the Bible in anything but a two column format. But the more I read from it the more I like it. It is, without a doubt, a much more comfortable and enjoyable reading experience. I find that I am able to read faster and more comfortably for much longer stretches of time then when I read from other Bibles. I use my Thompson and Pitt Minion when I’m studying. But when I want to just sit and read the Bible, the Clarion is absolutely the most enjoyable Bible I have ever read from. I’m sure I’ll be trying out and reviewing other Reader’s Bibles in the near future. I personally think this trend of focusing on the reading experience is a good thing. The Bible is, after all, meant to be read. 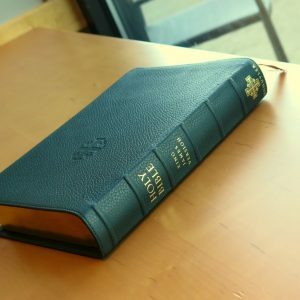 This review is for the black goatskin NKJV Clarion Bible. 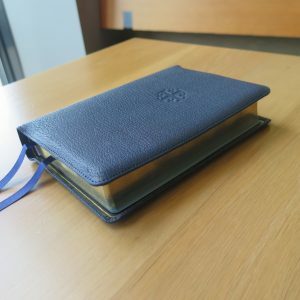 In this review, I will discuss the following: the translation, the size of the Bible, the goatskin cover, the format and content, and other miscellaneous items. Translation: First, let me say that English is my secondary language. I have gone from NIV 1984 to different translations like NASB, NLT, HCSB, GOD’S WORD, and ESV. 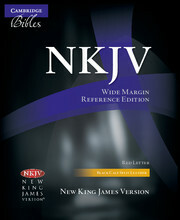 I eventually settled with the NKJV as the replacement for the beloved NIV 1984. Size: This is the ideal size Bible for me. It is less than 8 inches tall and less than 6 inches wide, and just a hair over an inch and a half thick. 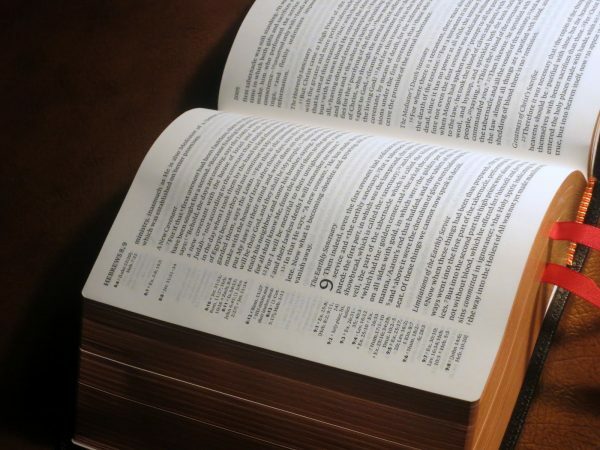 This is the most compact Bible out there for a single column format. There are thin line Bible out there, but they are 10 by 7 which is too tall and too wide. 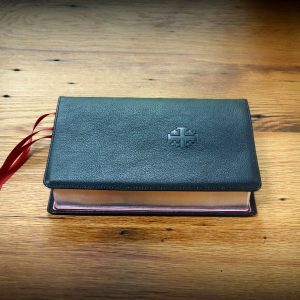 Cover: The most expensive of the Clarion Bibles is the black goatskin that is edge-lined. The goatskin is supple and feels good on the hands. The edge-lining is what truly makes this a premium Bible. Format and content: The Clarion NKJV is in single column format which makes reading easier. The references and translator’s notes are to the side which makes for easier referencing. The paper is average in thinness, but because of their line matching technique, there is hardly any ghosting or bleed through. The font they used is the Lexicon 1 which has an antique feel to it. The font size is 8.5 but surprisingly readable due to the spacing between the lines (lead in). 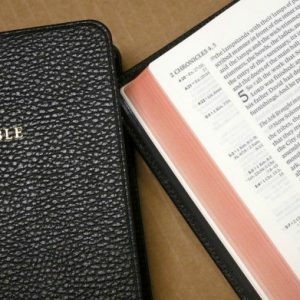 This Bible is printed in black text including the words of the Lord Jesus Christ, as it should be since the entire Bible is the Word of God. Black letter print also makes up for better reading under artificial light. Red letter editions become a problem when reading the Gospels and the first 3 chapters of Revelation because red ink in artificial light becomes unreadable. If Bible publishers want to highlight the Lord’s words, they should do it in darker colored ink like blue. But black letter edition is what I wanted, and all Clarion Bibles are in black letter text. This Bible comes with a concordance and 15 color maps with a map index. If you want to know where Bethel is located, you go to the map index, and it will show you what maps it is on along with the coordinates. This truly is an amazing feature. 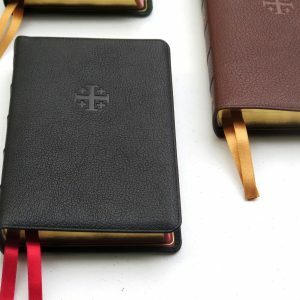 Miscellaneous: In other versions of the Clarion Bibles, particularly the ESV translation, there were some issues with the pages curling upward when the Bible is open, especially in the middle portion of the Bible. Some reviews of the NKJV Clarions also mention this. I was very scared that there will be curling issues on this Bible. However, I am happy to say that there is absolutely no curling of pages in the NKVJ goatskin Clarion that I got. 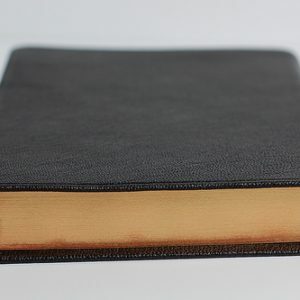 This Bible has Smythe-sewn binding which allows the Bible to open flat on Genesis 1 and Revelation 22. This black goatskin NKJV Clarion has gold gilded pages under red art gilt. It also comes with two red ribbons but I removed them because I don’t like ribbon markers on my Bible. For those who prefer ribbons, the ribbons on the Clarion is nothing extraordinary. The ribbons on R. L. Allan and Schuyler Bibles have better quality. Conclusion: This Bible costs around $170, but is well worth it […]. The Clarions are published by Jongbloed in the Netherlands. They are the same publishers for the NKJV Allan Single Column as well as the NKJV Schuyler Bibles. I owned both the Schuyler and Allan NKJV, and I did not like them. Both of them are heavy and large Bibles. The Schuyler NKJV is a bit better than the Allan because the Schuyler has thicker pages and line matching was excellent. R.L. Allan NKVJ is single column, but the line matching is not constant. Both were extremely heavy, and the font size is not at all bigger or better. The Clarion is smaller, lighter, yet the font size is more pleasing and readable to the eyes than the Schuyler and Clarion. I give this Bible 5 stars. If Cambridge had a baseball bat, and took a swing, a fan would catch this one somewhere near the 2nd deck! It’s that good! I didn’t evaluate the ribbons because I change them immediately almost all the time. The text on this is extremely readable and the bible size is easy to handle. I’ve heard other reviewers say that Cambridge with this text block/font has somehow created the perfect reading formula. Well it’s the truth!!! This bible would be my highest ranking bible if the system allowed for higher marks. To me, this is the perfect bible. It is readable, small (but fat), sewn so it opens flat on Genesis and Revelation, durable and flexible (I got the black goatskin). 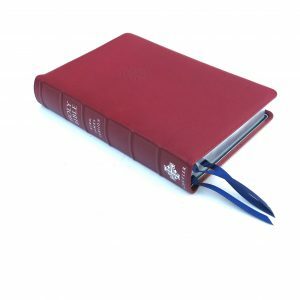 It has all the necessary bells and whistles of a premium bible, and it fulfills its purposes more than sufficiently. The one issue I think a buyer could potentially be disappointed in is the font size, though I seldom see reviewers disparage that because the font type and spacing has been specially selected to be extra readable. So much love, research and experience has went into the production of this bible. Its my first “high quality” bible (though all bibles are books of the highest quality of course) and I’ve used it frequently for over a year now and its still good as new. Thank you EB and Cambridge!